When I was little, every year my dad would cook Corned Beef and Cabbage for New Year’s Day He would also serve Black Eyed Peas, and we all had to have our Black Eyed Peas sometime during the day. As I got older and started my own family, I decided to carry on that tradition. I sat here today, thinking oh my….I better get to the store and get my Corned Beef and Black Eyed Peas. Now I must admit, that I have always done the peas the lazy way, and just bought them in a can, warmed them up and that was our dish. I may add a little bacon if I was feeling a little “festive” that day, but for the most part I just cut up some onion and added to the canned peas. I personally love them, although I can’t say that for the rest of the family. My hubby likes them as much as I do, however the kids are a different story. Of course that didn’t stop me from mandating that they ate them each year. My daughter, Tiffany, always holds her nose and swallows. She seriously hates them!! I only require they have a teaspoonful each New Years, so she manages. This year she is pregnant , so I am curious to see how that goes over. LOL My granddaughters have decided that they way their Aunt Tiffany eats the peas is the best way to get through the mandate of having to have their teaspoonful each year. I have compiled a list of recipes for you below on how to make Black Eyed Peas from scratch, instead of just buying the boring can at the grocery store. Several of the recipes call for either ham or sausage. You may have a ham bone or ham leftover from Christmas, this would be a great way to finish it off and clean out the fridge! I am hoping to entice my children to WANT to eat them this year, by trying one of these recipes. I will include a write up about it after New Years and let y’all know how that goes. I am curious, what does your family eat on New Years Day? Do you have any food traditions? Let me know in the comments below so I can see what other families do. If you chose one of the recipes I included, I would love to hear how that works out for you as well in comments!!! I have black-eyed peas with fat back. Greens and cornbread. I was raised in the south, so this is really good eating. Love it anytime. Fried chicken would top it all off. 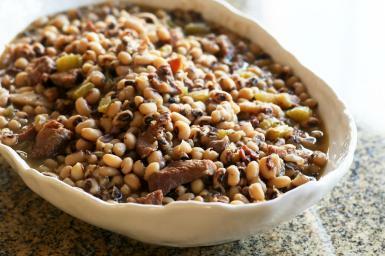 The black-eyed peas with sausages sound yummy! I can put it in my crock pot overnight while I sleep.I eat peas/beans more during the cold/cooler months, but with the sausages this could be a year round recipe. I love the Slow Cooked Black Eyed Peas recipe. I finally have a slow cooker, and I do like bean dishes as a main source of protein and other nutrients. No need to only have it once a year! I am so cooking these this year. I did a trial run and they were wonderful.